Following the successful creation of the Certified Fire Inspector I (CFI-I) certification program in 1998, further requests by local entities, state agencies, and national organizations prompted the NFPA to develop the Certified Fire Inspector II (CFI-II) certification program. 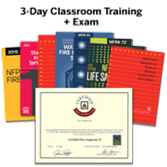 Like the CFI-I, the CFI-II is based on the NFPA 1031, Standard for Professional Qualifications for Fire Inspector and Plan Examiner. NOTE: Entry into the CFI-II certification program requires that you first attain the CFI-I certification. Jennifer McWhorter talks about the CFI-II certification. The CFI-II exam is offered in a computer-based format. The exam uses digitized plans, in a pop-up window, with scrolling and magnification capabilities. The computer-based exam is available at testing centers around the world. To locate a computer-based testing center near you, visit the test center Web site. Please refer to the candidate handbook (PDF) for details. 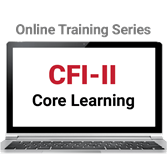 The CFI-II Core Learning Series includes vital training on NFPA 13, NFPA 25, NFPA 72®, and NFPA 101®. Designed to help you prepare for the Fire Inspector 2 certification exam, this course will familiarize you with the responsibilities of a fire inspector, and the knowledge required for the job. Based on the JPRs found in NFPA 1031. The latest version of the CFI-II exam is based on NFPA 1031, 2014 edition, Professional Qualifications for Fire Inspector and Plan Examiner. It is the candidate’s responsibility to obtain materials needed for study purposes and to have present during the examination. The following list contains the resources to be used in preparing for and taking the examination. All items in the examination are compatible with both code sets. Please verify with your jurisdiction or certification partnership agency for the proper set. NFPA 1, Fire Code - 2018 Ed. NFPA 13, Installation of Sprinkler Systems - 2016 Ed. NFPA 25, Standard for the ITM of Water-Based Fire Protection Systems - 2017 Ed. NFPA 72, National Fire Alarm Code® - 2016 Ed. NFPA 101®, Life Safety Code® - 2018 Ed. NFPA 1, Fire Code - 2015 Ed. NFPA 13, Installation of Sprinkler Systems - 2013 Ed. NFPA 25, Standard for the ITM of Water-Based Fire Protection Systems - 2014 Ed. NFPA 72, National Fire Alarm Code® - 2013 Ed. NFPA 101®, Life Safety Code® - 2015 Ed.